Rediff.com » Business » Now, valet parking for T3 passengers! Now, valet parking for T3 passengers! With the aim to provide world class facilities to passengers at the Indira Gandhi International airport, its operator Delhi International Airport Limited has launched 'valet parking' service at Terminal 3 of the airport. It is a premium and time-saving facility for passengers travelling through T3. The cars will be parked by friendly, trained and uniformed valet drivers in a safe and secure environment. The cars will be parked in the domestic VIP parking area of T3, DIAL said in a statement. parking was a real challenge with small parking lots and narrow exits. "This used to result in a lot of unnecessary traffic snarls. "With the opening of multi level car parking and customised services like 'Park and Fly' and 'Valet Parking', all this is a thing of the past," said I Prabhakara Rao, DIAL chief executive officer. The valet parking is competitively priced at Rs 300 for two hours, a DIAL spokesperson said. 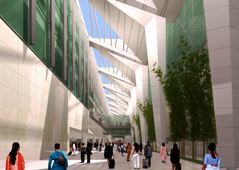 Terminal 3 provides a six-storied multi-level car park system, the largest car park in India. It can accommodate up to 4300 cars at any given point of time. The MLCP is connected to T3 and Airport Express Metro Station via an air conditioned skywalk.